Sunnyside Beach is iconic. 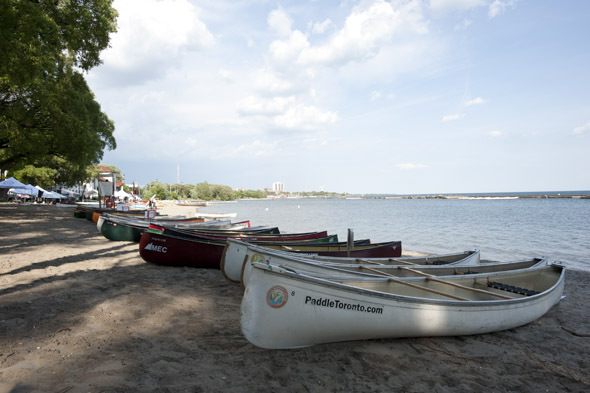 From 1922 to 1955, Sunnyside was the heart of the Toronto recreational scene. You've probably heard tales of concerts by Count Basie and Duke Ellington or seen grainy, black-and-white images of the beach packed with bathers. If you stand near the gleaming white bathing pavilion today, jazz music and laughter call out to you from across the decades. 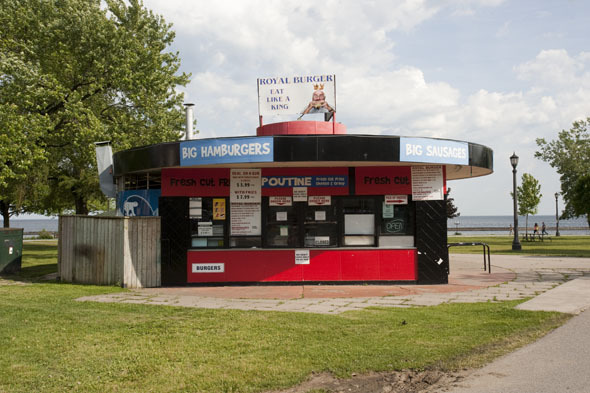 You can't help but feel a bit nostalgic when you visit Sunnyside Beach. The pavilion, the distant city skyline, the view out over Lake Ontario conjure up a time when the Toronto Railway Company ran free streetcars to the city's beaches. You can almost feel what Toronto might have been like if expressways did not slice across our waterfront, if the places where people live and play had remained more closely connected. When Metro Council started building the Gardiner Expressway in 1955, the new highway choked off the beach from the rest of the city. You still need to cross the highway to get to the beach, with the easiest access points at the foot of Roncesvalles, Parkside, or Colborne Lodge. As the city embraced the post-WWII development boom, Sunnyside languished. 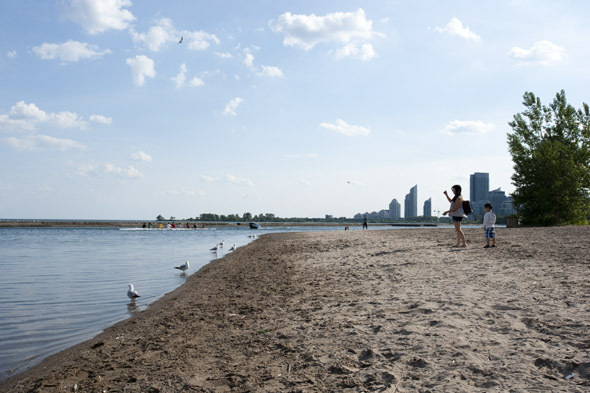 If you think Toronto's beaches are dirty, chances are the notorious sewage pollution and algae blooms at Sunnyside contributed to that perception. For decades, the city's under-equipped system would flush itself into Lake Ontario every time it rained and sewage would wash ashore. In the last 20 years or so, Sunnyside has been undergoing a kind of quiet renaissance. 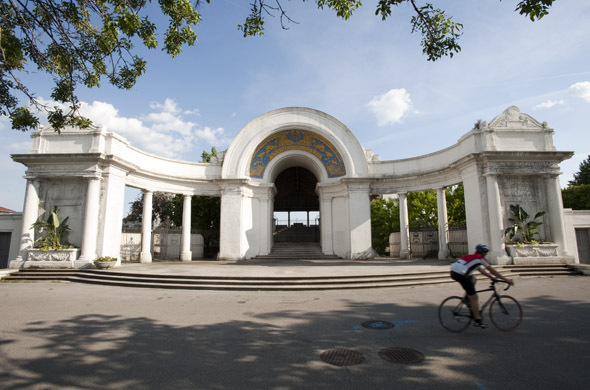 In 1980, the bathing pavilion was renovated. In 2002, new storage tanks were built to help keep sewage off of the beach. In 2006, the Palais Royale re-opened and brought some of the old glamour back to the area. You can swim at Sunnyside when the green flags are up. If you are concerned, check water quality results and look for seven consecutive days of clean water. Swimming is not the main reason people come to Sunnyside. People come here because the boardwalk and waterfront trail are better here than anywhere else in Toronto. The sunrise and sunset at Sunnyside are magical. Paddlers and rowers come for the flat water created by the protective break wall. Others because the same highway that holds the city at bay creates a line of linked parks stretching over 3.5-kilometres. 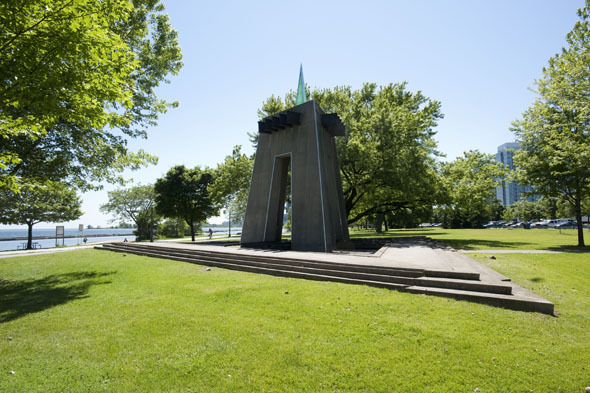 To the east of Sunnyside is Budapest Park, commemorating the 1956 Hungarian uprising. Stretching west from Sunnyside you find Sir Casimir Gzowski Park, named for the Russian-born railway developer who helped found the Queens Plate and the Canadian Society of Civil Engineers. If you cross the Humber River Arch Bridge, you will find Humber Bay Park, a man-made park separating the Humber River and Mimico Creek mouths. 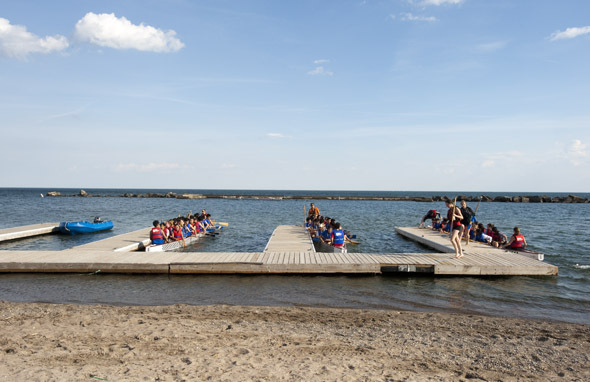 Even if strolling, biking, and rollerblading aren't your thing, you can easily spend hours at Sunnyside Beach. There are plenty of trees and lots of grass, making it cooler and shadier than the Eastern Beaches. 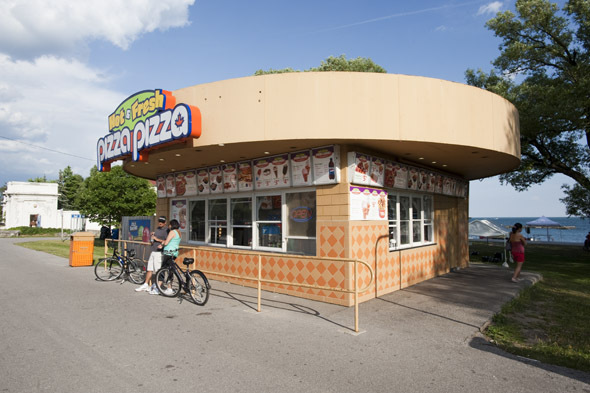 Sunnyside Pavilion Cafe offers a place to sit by the water over cold drinks and a plate of food that is a step above standard snack-bar fare. Sure, Sunnyside is not what it once was. It's something new, something that is evolving. But, it's still iconic. Transit: By car: Pay Parking (enter lots from eastbound Lakeshore only). By TTC: Take the 501 Queen streetcar westbound to Parkside Dr. or 80 Bus between Sherway Gardens and Keele Subway Station. Aggressiveness of seagulls and geese (out of 3): 2 (Birds are everywhere, so keep one eye on your food and the other eye on the ground).